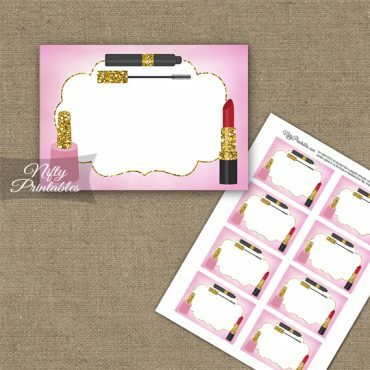 Cute printable makeup theme party decor – instant download decorations for spa birthday parties, makeup events, or any girlie celebration. 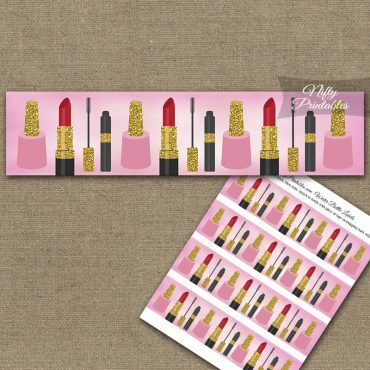 Pink background with gold trim, they feature red lipstick, pink nail polish and a mascara tube. 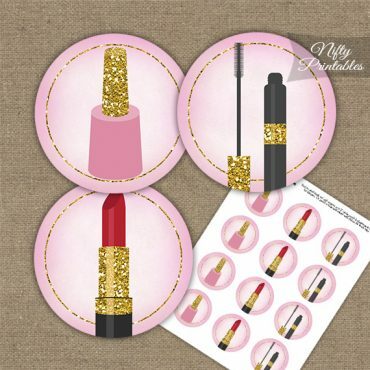 Available party supplies include printable makeup cupcake toppers, water bottle labels, thank you for coming favor tags, blank labels you can also use as nametags, as well as fold-over cards that are great for buffet tables or table place cards. Easy to download, print and cut: just print them on white card stock with Adobe Reader, then trim them with scissors or paper cutter (or a circle punch for the cupcake toppers). And voila…fabulous diy makeup party time!